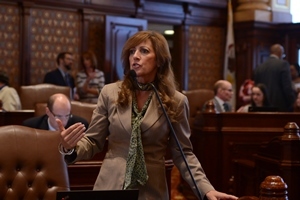 SPRINGFIELD – State Senator Linda Holmes (D-Aurora) passed a proposal through the Illinois Senate to create the Broadband Advisory Council to study expanding broadband access in Illinois. To ensure the needs of a wide variety of citizens are heard, the council will have representatives from electric cooperatives, municipalities, public housing authorizes, the Community College Board, the Board of Higher Education, the Department of Aging, the Department of Healthcare and Family Services , AARP and several other organizations that represent a wide scope of interests. 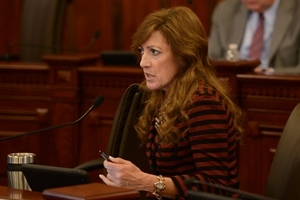 Holmes’ proposal, House Bill 5752, passed the Illinois Senate today with a vote of 57-0. It has now passed both chambers of the Illinois General Assembly. SPRINGFIELD – State Senator Linda Holmes (D-Aurora) advanced legislation to ban sales on ivory through a key senate committee earlier today. According to the World Wildlife Foundation, tens of thousands of elephants are killed every year for their ivory tusks. In the 1980s, it is estimated nearly 100,000 elephants were killed each year and up to 80 percent of herds were lost in some areas. Holmes’ proposal, House Bill 4843, charges individuals caught selling ivory with a Class A misdemeanor and fine of up to $1000. “Decades of senseless poaching have totally decimated the populations of these animals across the world. Only with time and commonsense measures like this will we ever see their numbers recover,” Holmes said. Guns and knives that are older than 100 years and less than 20 percent ivory are exempt from the ban. Musical instruments older than 1975 and made from less than 20 percent ivory are also exempt from the ban. If signed into law, Illinois will join California, Hawaii, Nevada, New Jersey, New York, Oregon and Washington in banning the sale of ivory. Holmes’ proposal passed the Illinois Senate Environment and Conservation Committee with a vote of 5-0. It will now head to the Senate floor for a vote. SPRINGFIELD – State Senator Linda Holmes (D-Aurora) advanced a series of proposals through a key Senate committee yesterday to extend the same rights granted to firefighters to paramedics that are also employed by units of local government. The legislation will only affect the approximately sixty paramedics employed by units of local government, which includes those in Masouctah, Menard County, Morton, Highland, Troy and Union County. 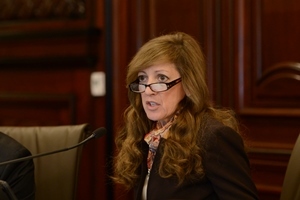 The proposals Each of Holmes’ proposals passed the Illinois Senate Labor Committee yesterday. They will now be heard by the full Illinois Senate. SPRINGFIELD – To combat the growing obesity epidemic, the Illinois Senate passed Senate Bill 2572 to require public school districts to offer 150 minutes of physical education to students in grades K-12 each week. State Senator Linda Holmes (D-Aurora) was the sponsor. As of 2016, more that 31 percent of Illinois adults were considered obese, ranking 18th in the United States. This is a significant increase from 20 percent in 2000 and 12 percent in 1990. Previously, school districts were required to offer daily physical education classes. The new school funding formula passed by the General Assembly in 2017 decreased the physical education requirement to three days per week. Holmes’s proposal allows the school districts to decide the frequency of classes, as long as they provide a total of 150 minutes each week. 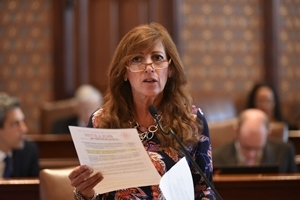 The bill, supported by many health organizations including the American Diabetes Association, American Academy of Pediatrics and American Heart Association, passed the Illinois Senate with a bipartisan vote of 36-14. It will now head to the Illinois House for consideration.